Vice-President Joe Biden said at the beginning of a tour of East Asia that the US remains “deeply concerned” about China’s new air defense identification zone (ADIZ). In written responses to Japan’s Asahi newspaper, Joe Biden said China and Japan had to establish measures to lower tensions. 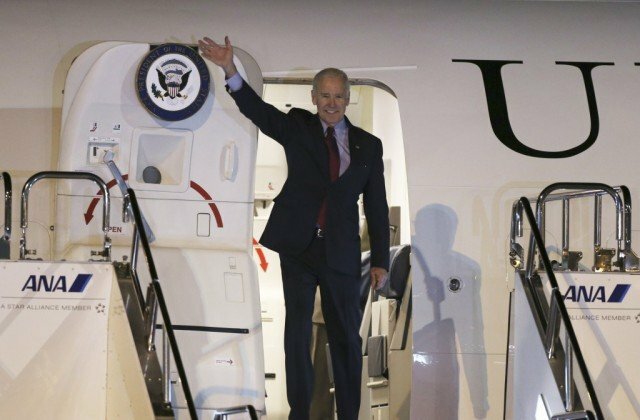 Joe Biden arrived in Tokyo late on Monday and will then head to Beijing and Seoul during his six-day visit. The air zone row is likely to dominate the week of talks. Joe Biden’s most important task this week will be persuading Beijing and Tokyo to stop baiting each other, and to start talking about how to avoid an unintended clash. Both the US and Japan have voiced strong criticism of China’s establishment of an ADIZ that includes islands claimed and controlled by Japan. It also includes a submerged rock claimed by South Korea. China says aircraft operating within its ADIZ must follow certain rules such as filing flight plans, or face “defensive emergency measures”. US, Japanese and South Korean military aircraft have all defied these rules and Japanese commercial carriers have agreed to a government request not to comply. On Friday, China scrambled fighter jets to monitor US and Japanese planes flying in the area. Joe Biden told the newspaper that the establishment of the ADIZ underscored “the need for agreement between China and Japan to establish crisis management and confidence building measures to lower tensions”. As well as “the strength of our alliance commitments” with Japan, he planned to “emphasize the importance of avoiding actions that could undermine peace, security and prosperity in the region”, he said. Joe Biden was met at the airport late on Monday by the new US envoy to Japan, Caroline Kennedy. Later on Tuesday, he meets Japanese PM Shinzo Abe. Shinzo Abe said on Sunday that he expected to discuss the ADIZ issue with Joe Biden. Tokyo has told its national carriers JAL and ANA not to file flight plans with the Chinese side when transiting the zone, but on Friday the US said it expected its carriers to “operate consistent with Notams (Notices to Airmen) issued by foreign countries”. This did not indicate “US government acceptance of China’s requirements for operating in the newly-declared ADIZ”, the state department said. Shinzo Abe said on Sunday he expected to have “in-depth” talks with Joe Biden about the ADIZ row. Japan, he said, would “resolutely but calmly deal with Beijing’s attempt to change the status quo” in the region. Tensions between Japan and China have been high for months because of a territorial row over islands in the East China Sea. Japan controls the islands, which are called Senkaku in Japan and Diaoyu in China. They are also claimed by Taiwan and lie in a strategically important area south of Japan and north of Taiwan. The US has described China’s move as destabilizing. After Tokyo, VP Joe Biden heads to Beijing for talks with President Xi Jinping and then travels on to South Korea.